As we breach the top 15, the decisions just get more and more difficult. The Destroyer set as it was called in tier 5 was an improvement in almost every way over the tier 2 Wrath set on which it was based. 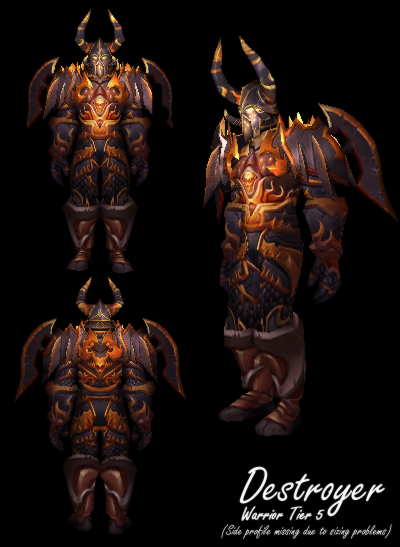 With refined but still deadly looking shoulder blades and some truly wicked helm horns – which by the way look eerily similar to the arena season 10 Death Knight set – the Destroyer battle gear was fearsome in its day and holds up very well today against tier 12… obsolete stats aside of course. This entry was posted on July 1, 2011 at 12:49 am and is filed under General, HFL, MMO, Raiding, Role Playing, World of Warcraft. You can follow any responses to this entry through the RSS 2.0 feed. You can leave a response, or trackback from your own site.